Open Your Suitcase | Comics I Don't Understand - This site is now being updated daily at http://www.comicsidontunderstand.com. Please change your bookmark if necessary, and notify any web site with a link to the old address. 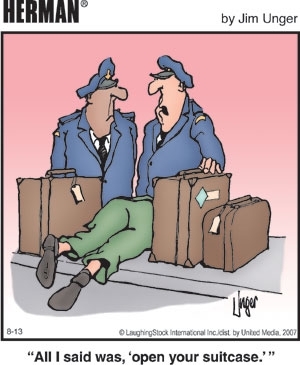 Jim Unger always liked doing strips about customs agents and smugglers (smuggling things like watches or cameras to avoid duty, not drugs). This guy is apparently so guilty that he passed out when confronted. I’m sure I don’t get the joke, and I’m sure Mr. Unger didn’t mean for it to look as suggestive as it does. Yet it really does look like it belongs on the Arlo page. Is my comment not showing up? The urban dictionary definitions (the first two) should explain why the traveler is in that particular stance – he’s awaiting a particular examination based on the slang usage of the term ‘suitcase.’ While I did mark it as NSFW, I don’t mean that it’s [too] nasty, but just that you should err on the safe side. OH. I felt that Unger was too “square” to know “suitcase” as slang. OK, that works. Just a note: I saw this cartoon in a “Herman” compilation art least thirty years ago… these cartoons are not fresh, folks. So take that into account when discussing slang possibilities. Actually, I have assumed (for decades) that the passenger fainted at the necessity of unpacking and repacking a suitcase packed to the limits of caacity and beyond. It was amuch more innocent age back then. Yeah I’d probably go with the “passing out” argument. Seems to make the most sense, but I don’t see how it has any pop-references considering its quite an old one.